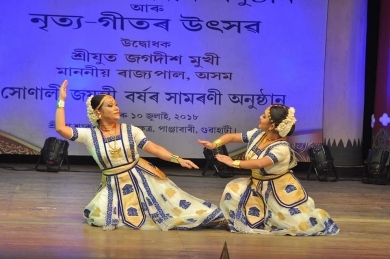 The three-day Annual Festival of Dance and Music by Sangeet Sattra, Guwahati, and the conclusion of their Golden Jubilee year celebrations was a meticulously organized event. 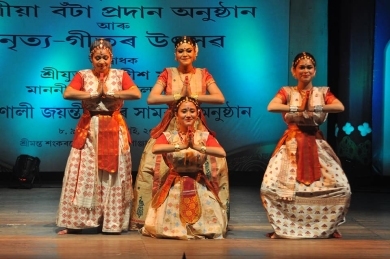 The two dancer daughters of the founder principal Guru Raseswar Saikia Borbayan, Ranjumoni and Rinjumoni Saikia were the motive force behind this festival which showcased different Indian classical dance styles. The final evening at the Sri Sri Madhavdeva International Auditorium saw some scintillating performances by reputed dancers after the ritualistic Borgeet by Prasanta Rajkhowa, Ripunjeet Borah and Khairuddin Ahmed in taal Karman and Khol Badan by the children of the institution. The senior dancers of Sangeet Sattra presented 'Surpanakhar Nasika Chedan' (the mutilation of Surpanakha's nose) based on the popular episode from Ramayana. The dance drama was invariably preceded by the Pravesiki Dhruva or Prabesar Gita (entrance song) ushering in the dancers. The performance began with the Gosai Provesh Nach, the entrance dance of Lord Rama, Lakshman and Sita. The harmonious blend of tandava and lasya style evoked the total impression of majesty and grace. The nritya numbers highlighting the theme were primarily governed by angikabhinaya by well-trained dancers. Surpanakha gave a good account of herself and Rama fitted well into the role. A rare performance of the popular Shiva Panchakshara Stotram, "Naagendraharaya Trilochanaya" came from the promising thirty year old Sinam Basu Singh, a young recipient of the Ustad Bismillah Khan Yuva Puraskar. In his execution, the versatile dancer had complete command over stance and poise and astonished the audience with his composition that incorporated the Lai Haraoba movements to describe the Panchakshara or five letters. Body parts were related to symbolize the "chandra" (crescent moon) by touching the neck with the ardhachandra mudra, "saap" (snake) by touching the cheek with both the hands and the like to portray Shiva. There was no aggression in his dancing. Basu artistically portrayed "Om Namah Shivaya" with his highly internalized expressions and scholarly approach celebrating the Stotra, smiling at times, and thus conveyed some old traditional Lai Haraoba movements to the audience. The subtle body inflections and gentle glides of the legs were soaked in lyrical grace, bringing alive each word especially in the line "Mandakini salila chandana charchitaya." The captivating piece was composed in the 7 matra Daskosh taal and 28 matra Brahma taal. The music was by Mahendra Sharma and Bhagat, with suggestions by Basu. There is a need for scholar dancers like Basu, who can sift the best out of the text, movement principles, music and nuances to offer a holistic view to the performance through the basic language of dance. Anita Sharma is a reputed Sattriya dancer trained under the stalwart Guru Jatin Goswami. Watching her perform in a duet with her daughter Aarhie Kaushik was a highly enjoyable experience. Beginning with "Krishna Shankar Guru Hari" the Namghosa "Krishna karibo dhukho haari, kalomayabi rupa adhikari", composed by Sri Sri Madhavdeva, in ektaal and sutkala tala was an excerpt from 'Bor Ramdani.' There was good coordination between the two dancers, without any mismatch in the facial expressions. Aarhie is trained well and the young dancer was energetic in the 'Kenduk Khel' (game of the ball) but the senior dancer naturally ruled the stage. The imagery in "Mayi haro Gokulchand aaway" (Ma, look, Gukulchand comes) was appealing. 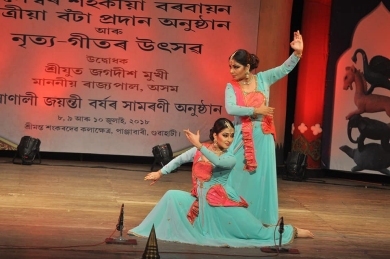 The second set of mother - daughter duo was Kathak dancers Marami and Megharanjani Medhi. Marami, a dynamic and accomplished dancer from Assam is known for popularizing the form in the state. She is the founder of a Kathak dance institute Sur Sangam. The mother-daughter duo has performed widely at home and abroad. Entering with Chakkars, Marami followed by Megharanjani, began with Shiva Vandana, "Naagendraharaya" in raga Bairagi- Bhairavi, taal Kaharba. Both have fine stage presence, the sea-green, peach combination of their designer costumes, enhancing their confidence! They passed on to teentaal, madhya laya followed by "tata ta thunga" bols showcasing sharp control over rhythm. Naturally, Marami's maturity and aggressive grip over footwork cannot be matched by her daughter's but it must be agreed that Megharanjani is a fine dancer in the making. The nritta had a good finish even though it was too vigorous at times. The concluding thumri "Kaaliya sang karata rangaraliya" was the ultimate in music, singing, dancing and rejoicing with some interesting formations seldom seen in Kathak. Joyprakash Medhi, a renowned singer and Marami's husband, gave fine vocal support.